Heat frying pan over medium-high heat. Either spray with cooking spray or add a tablespoon of water and onion and bell pepper to sauté. Cook for one to two minutes stirring frequently and then add cauliflower and Creole seasoning. Cook for another two to four minutes and add HMR program entree. Mix thoroughly and cook for another two to four minutes until heated through. One gigantic serving or two smaller servings. Bulked up for just a few extra calories! Cook time varies because it depends on how soft you want your cauliflower rice. Add hot sauce if you want an extra kick! This entry was posted on November 16, 2016 by uncoveringfood. 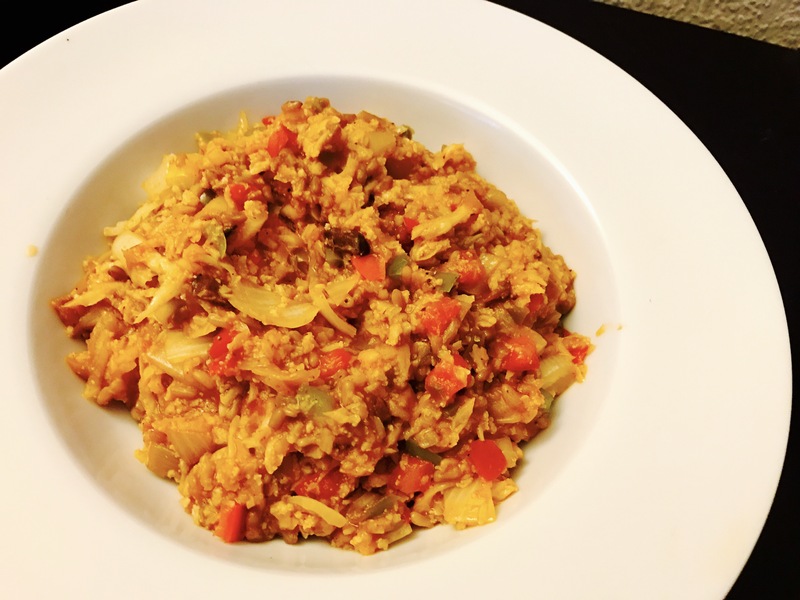 It was filed under Food, HMR Diet and was tagged with cauliflower rice, healthy solutions recipe, HMR, HMR Diet, hmr entree, HMR healthy solutions, hmr program, HMR Recipe, recipe, weight loss, weight management.